On the 21-22 of March, representatives of the North Sea Commission (NSC) met with youth representatives from its member regions in Sandnes, Rogaland county, Norway, to discuss youth participation in the political processes of their respective regions as well as how youth engagement could be translated into the work of the NSC. During the first day, the delegates informed each other on how youth participation functions in their regions, followed by group discussions where delegates exchanged views and experiences on how they manage to influence regional policies. On the second day, attendants were invited to participate in the selection of priorities for the North Sea Commission post 2020. Here, the delegates in principle supported the main priorities proposed by the NSC task force set up for this but underlined the importance of working with environmental and climate issues. Finally, the conference also discussed how youth can have a say in the future work of the NSC, and several proposals were put forward. The need for annual meetings in person as well as continued contact between youth delegates throughout the year were underlined. Delegates also pressed the need to incorporate youth participation in the work of the four thematic groups of the NSC. The Executive Committee of the NSC will start discussing these issues at its meeting in Southend-on-Sea on 5 April. 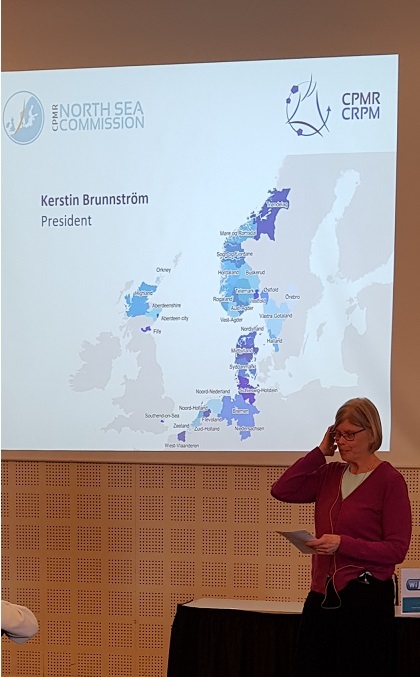 Opening adress given by Kerstin Brunnström, president of the North Sea Commission. Inspired discussions and presentations took place throughout both days of the conference. Closing day photo with youth representatives from five countries (Scotland, Norway, Sweden, Denmark and the Netherlands).